In one handy little volume, Little Black Book of Junk Science, we provide an A to Z (okay, A to Y) guide to the most common myths and misunderstandings surrounding health fads, diets, chemicals, and other pseudoscience. We hope it provides a small dose of sanity in a world full of junk science. 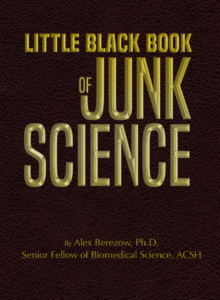 Little Black Book of Junk Science is available from ACSH.